Is the Fisher-Price Rock ‘N Play safe?? That’s the question on the mind of so many parents and caregivers after last week’s new urgent warning to parents from the United States Consumer Product Safety Department. I don’t usually post about recalls or things like this, but we used the Rock ‘N Play with both of our younger daughters — they loved it! Since it was such a life-saver for us, I always raved about it to friends and fellow moms-to-be. I even included the Rock ‘N Play on my list of the top 5 things that need to be on your baby registry. Because I’ve recommended it for years to all my readers and friends, I feel a certain responsibility to make an update about the Rock ‘N Play due to a new consumer warning. There have now been at least 32 infant deaths linked to the use of the Rock ‘N Play sleeper. This recall comes just days after the Consumer Product Safety Division issued an urgent warning to parents to stop using the Rock ‘N Play after their babies are able to roll. The previous warning was in response to the reveal of 10 deaths caused by the Rock ‘N Play. Now that the number has increased, the American Academy of Pediatrics joined in pressuring the Fisher-Price to go a step further and recall the product. We loved and used the Rock ‘N Play with both of our youngest daughters, but due to the recall I no longer recommend as one of my top baby products. Since 2015, there have been 10 reported infant deaths as a result of rolling over in the Rock N’ Play, while unrestrained. All of these infants were over three months of age. Previously, the Consumer Product Safety Division warned parents to only use reclined sleepers and rockers WITH restraints. According to Fisher-Price, the Rock ‘N Play meets all “applicable safety standards.” If you’ve ever bought or used one, you’ve likely noticed that the Rock ‘N Play has safety warnings prominently displayed on the product itself (like car seats) as well as the manual. Keep all sleeping areas free from blankets, stuffed animals, etc. Though it makes them no less tragic, it is important to note that all of the reported infant deaths associated with the Rock ‘N Play happened when the infants were over three months of age (when babies often start to roll) AND unrestrained. That being said, I’m not about to judge those parents. None of us are perfect and we’re all just trying our best. Accidents happen, but I want to help spread this message to help prevent any more. Like many parents, an accident like this is my worse nightmare. It’s the reason I was so vigilant about buckling our babies in every single time we put them in the Rock ‘N Play. However, I do have to admit that we used the Rock ‘N Play longer than three months. Knowing what I know now, I wouldn’t do that again — I would have insisted that we stop and switch to the crib for ALL naps and sleeping. Transitioning to a crib and dealing with baby sleep regressions is tough (I know from experience!) It’s so tempting to use the Rock ‘N Play longer than recommended because it’s easy. Babies sleep SO well in the Rock ‘N Play! I know many parents who used the Rock ‘N Play to get their baby to sleep better. We did too – longer than we should have probably. That’s the main reason I wanted to help get the word out. 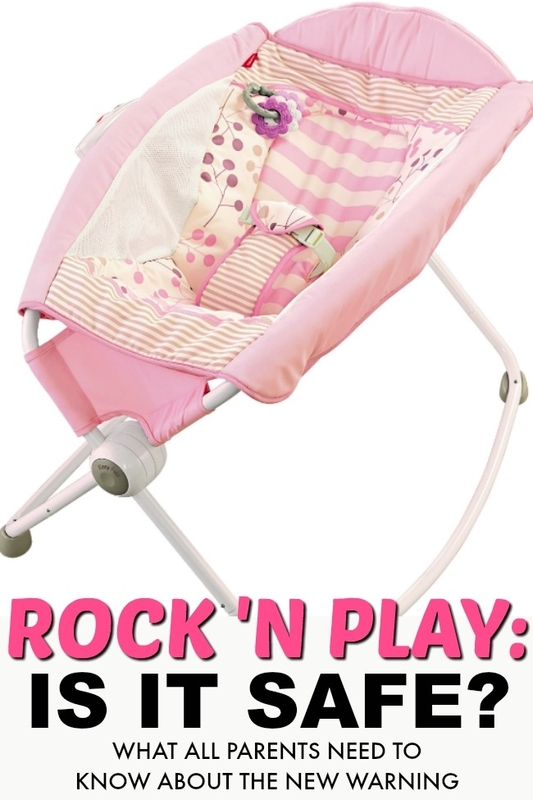 The Rock ‘N Play was and still is one of my absolute favorite and most useful baby products, and should still be safe if used according to the product safety recommendations. I loved the Rock ‘N Play and our babies did too. However, it’s SO important to use the restraints EVERY single time and use the crib instead when your baby starts to roll. If you know any parents-to-be or parents of newborns, share this message. And if you are using the Rock ‘N Play for your precious little one, be sure to use it safely.